With production expected to begin soon on Disney's live-action remake of Mulan, and the cast coming together, a new report claims that the studio will be shelling out the big bucks for this project. While it has yet to be confirmed with the studio, a report claims that Disney has set aside close to $300 million for this adventure, making it one of the most expensive live-action movies of all time. If this report is accurate, it will also be the most expensive movie ever made by a female director, with Niki Caro taking the helm. Pre-production is currently under way in New Zealand, with Disney using the same crew to build sets that were used on the Marvel Cinematic Universe adventure Thor: Ragnarok. The sets they are building are said to be massive and of "unprecedented scale." The sets are currently in the design phase, and it will take an "ample amount of time" to build these enormous structures. The crew is expected to compete everything by August, when principal photography is slated to begin. Niki Caro will be just the fourth female filmmaker to direct a live-action movie that costs more than $100 million, following Kathryn Bigelow (K-12: The Widowmaker), Patty Jenkins (Wonder Woman) and Ava DuVernay (A Wrinkle in Time). If this budget is confirmed, then Niki Caro will be the first female director ever to tackle a movie that costs more than $200 million, but she may have some company soon. Back in March, it was confirmed that Ava DuVernay is heading to the DC universe to direct The New Gods, and while no budget details were given for that project, it wouldn't be surprising if it cost more than $200 million. While we wait for production to begin, Disney has been assembling quite the cast for Mulan thus far. Liu Yifei, a.k.a. Crystal Liu, has signed on to portray the title character, while Chinese superstar Donnie Yen has signed on to play Commander Tun, a mentor to Mulan. We also reported last month that Chinese icons Jet Li and Gong Li have come aboard to star, with Jet Li reportedly playing the Emperor of China, a role voiced by Pat Morita in the original, 1998 animated movie Mulan, while Gong Li is playing the main villain, who is said to be a "powerful witch." This report from Pursue News has not yet been confirmed by Disney at this time. If the news about Gong Li's villain is accurate, that means this will be much different than the animated version of Mulan, where the villain was Shan Yu, the leader of the Huns. The cast also includes Xana Tang who plays the sister of Mulan, another new addition that wasn't part of the original animated movie. 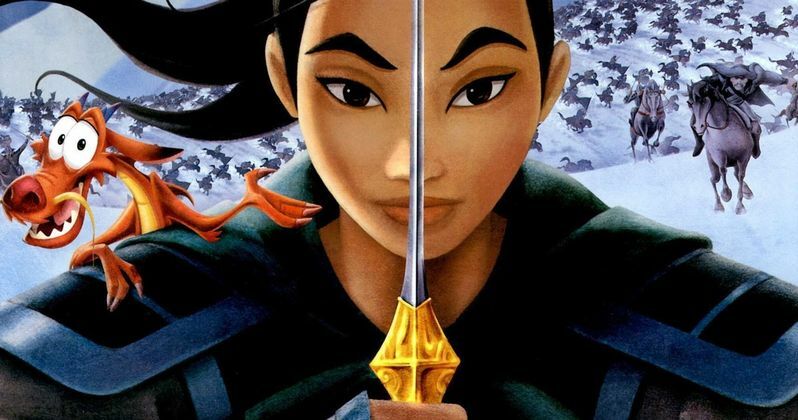 Niki Caro is directing from a screenplay by Lauren Hynek, Elizabeth Martin, Rick Jaffa and Amanda Silver, with Disney setting a March 27, 2020 release date for this highly-anticipated live-action version of Mulan.